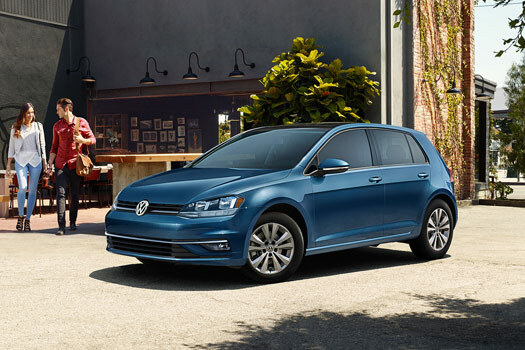 The Volkswagen is a motor maker, but the stature it enjoys is not a one-night success story, instead, VW evolved, keeping in view what exactly buyers want. Other than facing competition from other manufacturers, it also faces rivalry from within the Volkswagen Group, thanks to twelve subsidiaries it owns. The Volkswagen usually referred to as VW, is basically a German automaker which was established in 1937, headquartered in Wolfsburg. Volkswagen Golf is made an enjoyable car to drive. It is quite comfortable and noiseless, coupled with precise steering, lots of grips and negligible body lean. Whether a straight road or a twisty road, the regular Golf entertain the drivers abundantly. A plus point of this vehicle is that even being a less powerful model, it enjoys exactly the same grasp and response on-road as the other larger-engine members. What does it mean? Well, the answer is that you can exploit all the power available without fearing any breaching the car’s performance limits. Thanks to its impressive comfort combined with fun to quicken the pulse, Golf can be seen as more of an all-rounder vehicle. The six-speed manual gearbox is pleasantly smooth to use, with gears that change effortlessly. The newest seven-speed dual-clutch DSG automatic gearbox, on the other hand, is occasionally a bit irregular. A big news came for the Golf in 2017 with the launch of the 1.5-litre engine, providing a balanced power and economy stat. the 148bhp version is quite impressive and helps it feel sprightlier than its fuel economy suggests. It employs a cylinder-deactivation system, shyly shutting down parts when full power isn’t needed. Moreover, in case of engine failure, Recon Volkswagen Golf engine may come handy for you at VW authorised garages. The exceptional 128bhp Blue Motion version lets the engine to switch off completely and coast throughout deceleration. This eco-focused engine still yields a decent show, with acceleration from 0-62mph in just of 8.8 seconds. The smallest in the category, 1.0-litre engine, impresses in terms of how effectively it organises its comparatively low 84bhp power output. It drags from 0-62mph in only 11.9 seconds. Only when longer sessions of acceleration are pulled, its limitations expose. All the diesel engines are decent performers, with the 148bhp 2.0-Litre enables the car to sprint from 0-62mph in just 8.6 seconds. However, 113bhp 1.6-litre TDI provides more power and runs from 0-62mph in 10.2 seconds and is more fuel-efficient. Volkswagen Golf used engines for sale are also available if your VW diesel engine breaks down. If you are among people who like the feel and sound of the engine, you’ll be happy to discover a more powerful 108bhp version is also accessible, which adds the facility of sixth gear to the manual gearbox. This ultimately makes the 1.0-litre a far more eager companion on motorways while catching an acceleration of 0-62mph under 10 seconds. The latest Golf was awarded a full five-star safety rating by Euro NCAP with each and every area of the car is rated as well protected. Consequently, a very high occupant protection score of 94% was achieved along with an 89% rating for child protection rating. Pedestrian protection, on the other hand, was valued at 65%.